Monica here! I am back on the blog to share a beautiful card with you! I have a quick YouTube video to share with you where I go over the details of the card as well as go over the products used. As treat I have also added a process video towards the end to show you actually assembling the card. The video will be listed below the photo. Stunning card! Love those flowers! Just beautiful Monica! Love the soft color with the striking gold! Great inspiration ... thanks! This is so stunning Monica. Well done! Fantastic work with these dies Monica! 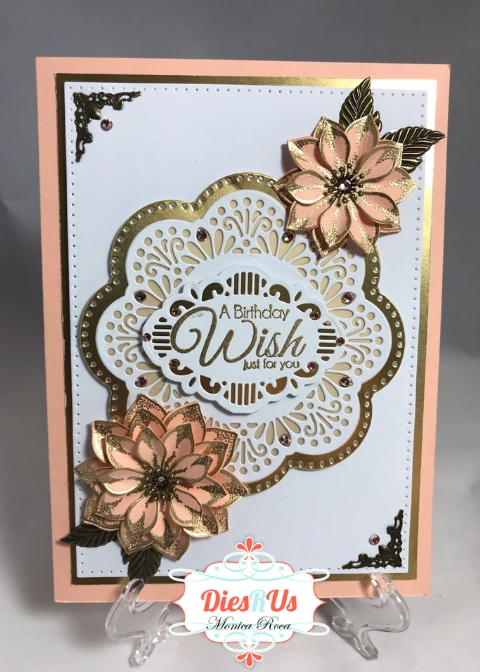 LOVE the dies and the Gold touches for a wonderful design that looks so classy! So beautiful and elegant. Love the gold accents.